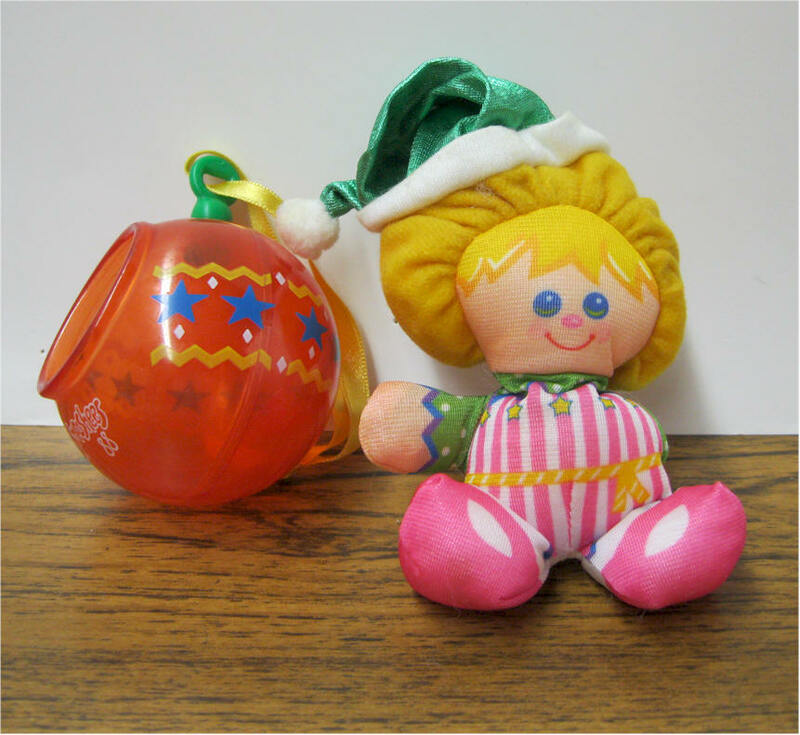 Fisher Price Smooshees - Played with condition. MINT IN BOX> Set in complete. Pieces in original plastic bags. Never played with. Includes Jenny, bed, dresser, 2 chairs, umbrella, table and swing. Furniture for the Smooshees house. 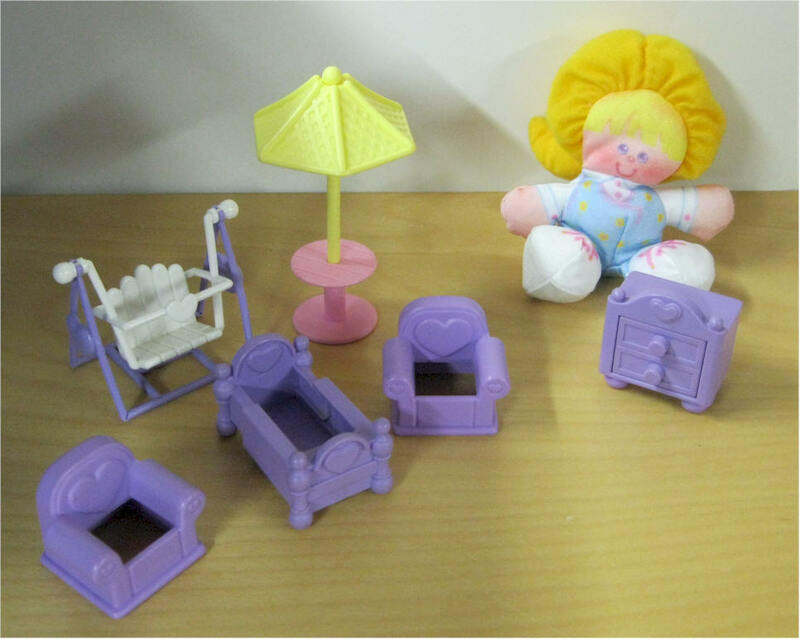 Includes: 2 chairs, bed, swing, dresser, unbrella w table and girl smooshees. 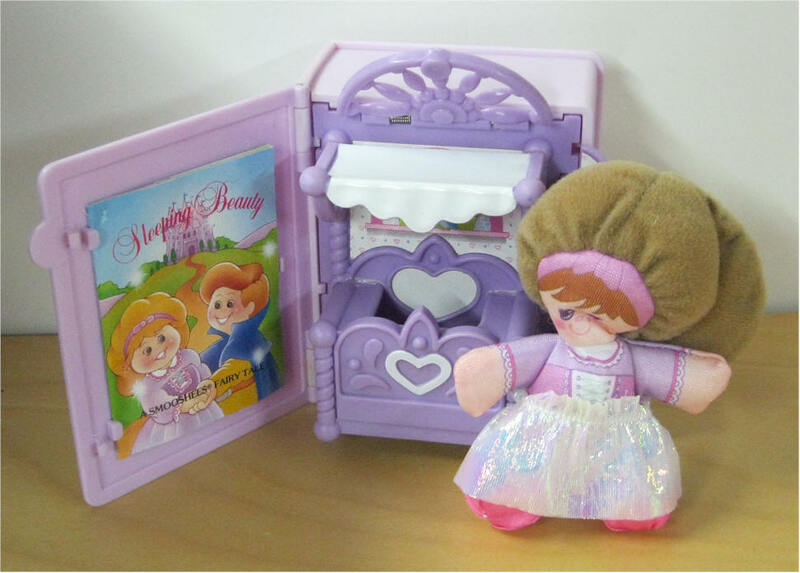 RARE - 1988 A Smooshees Fairy Tale "Sleeping Beauty"This is a Smooshees Sleeping Beauty set from the Cuddler Tales line. Includes Sleeping Beauty smooshees and the book. RARE - BALLOON ADVENTURE - Comes with balloon and smooshees. Rascal Raccoon set includes a Smooshee raccoon, and a small hollow tree stump that the raccoon can be smooshed into. 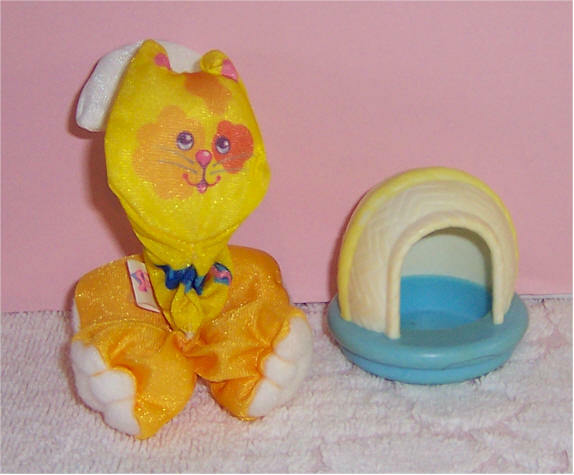 Itty Bitty Kitty set includes a Yellow Smooshee kitty cat, and a round hard plastic cat house that Kitty can be smooshed into. 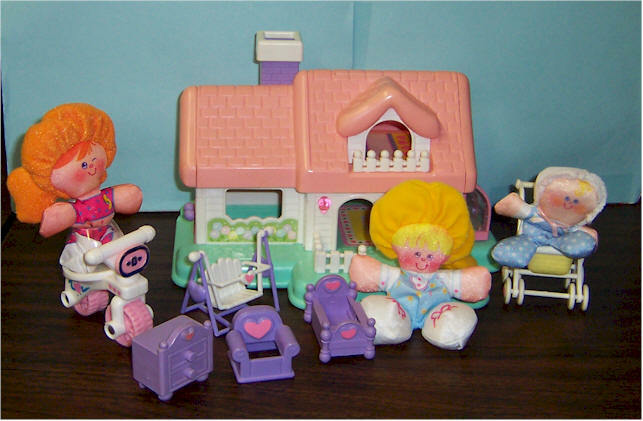 The Prancy Pony set includes a Smooshee pony, and a small horse stable that the pony can be smooshed into. 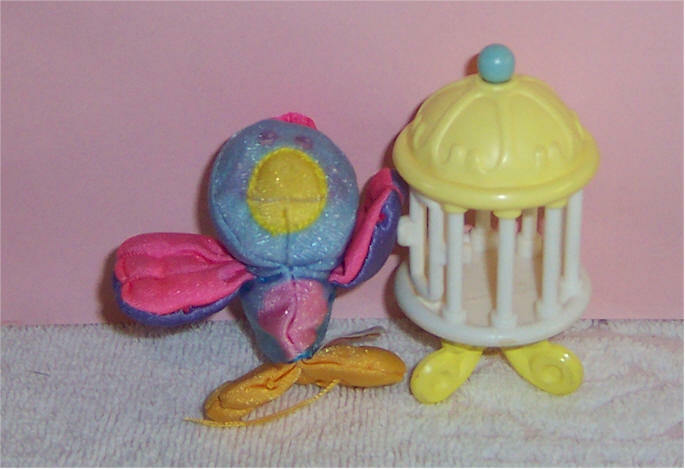 Perchy Bird set includes a Smooshee bird, and a tiny bird cage that the bird can be smooshed into. 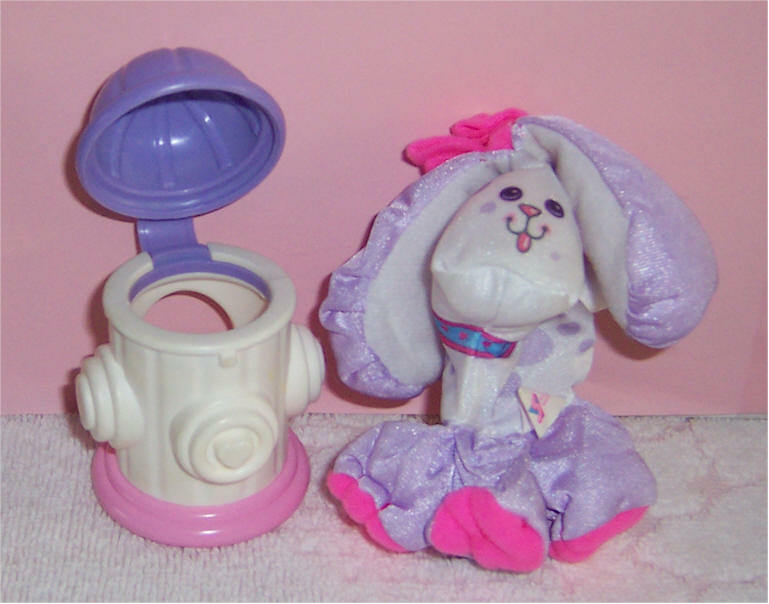 Heidi Bunny set includes a Smooshee bunny rabbit, and a small hollow log that the bunny can be smooshed into. 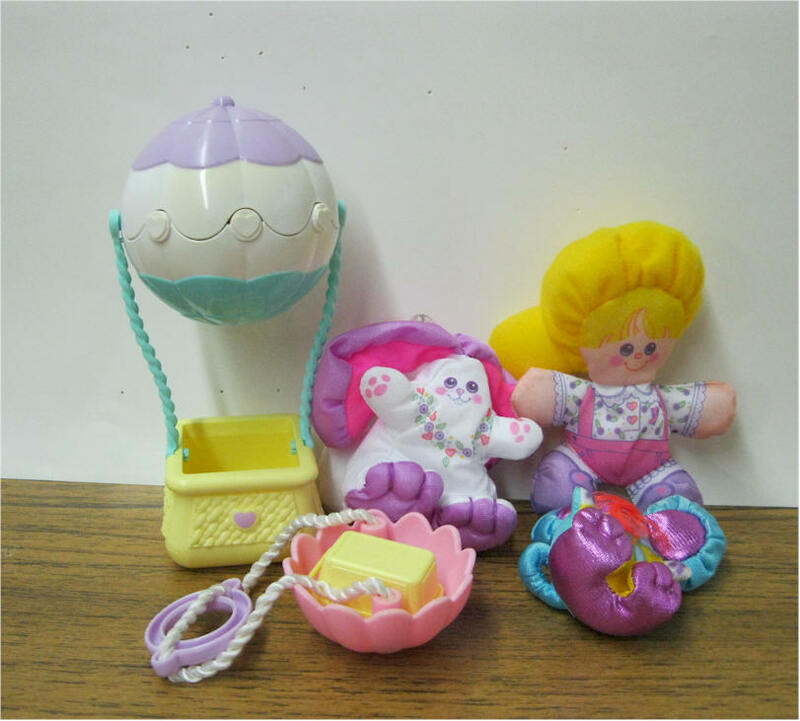 Shelly Turtle set includes a Smooshee turtle, and a tiny turtle shell that the turtle can be smooshed into. 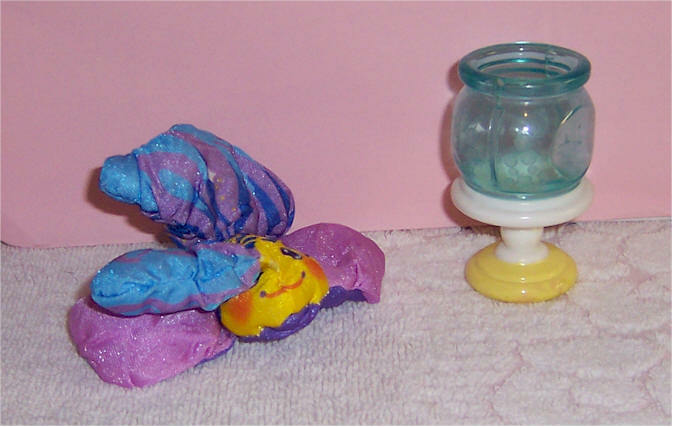 Squish Fish set includes a Smooshee fish, and a tiny fish bowl that the fish can be smooshed into. 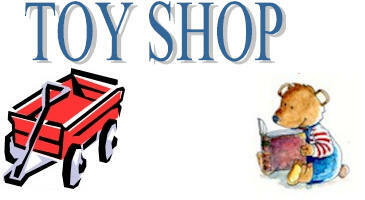 "Tops the Pup" set includes a Smooshee dog, and a tiny fire hydrant that the pup can be smooshed into. 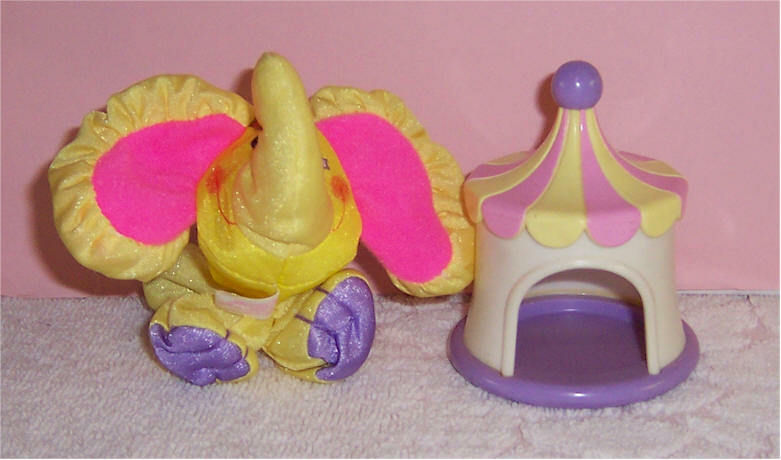 Tinker Elephant set includes a Smooshee elephant, and a tiny circus tent that the elephant can be smooshed into. BETH with her bicycle. 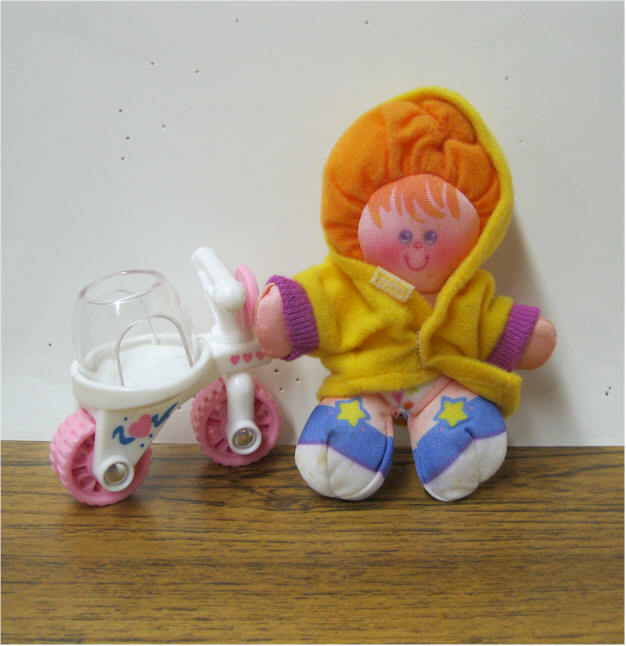 This set includes a removable one-piece outfit that fits Beth, and an accessory bicycle that the Smooshee can be smooshed into. Boy w jacket with bike.. 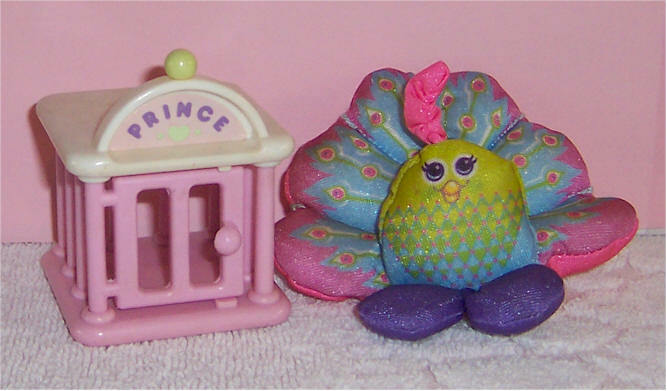 Prince Peacock set includes a beautiful Smooshee peacock and a tiny birdcage that the peacock can be smooshed into. 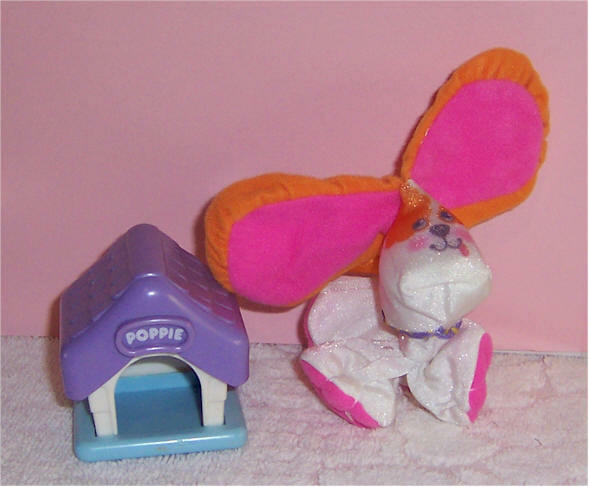 Poppie Puppy set includes a Smooshee puppy dog, and a dog house that the dog can be smooshed into. 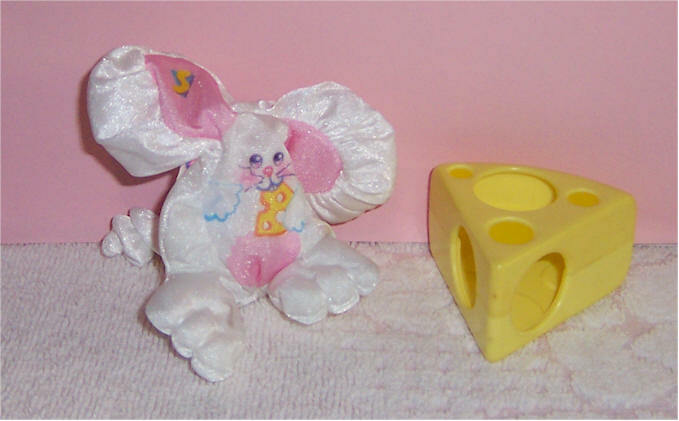 Nibble Mouse set includes a Smooshee mouse, and a small piece of plastic Swiss cheese that the mouse can be smooshed into. This is Mary and her Smooshee pet pony Companion Missy Mare. 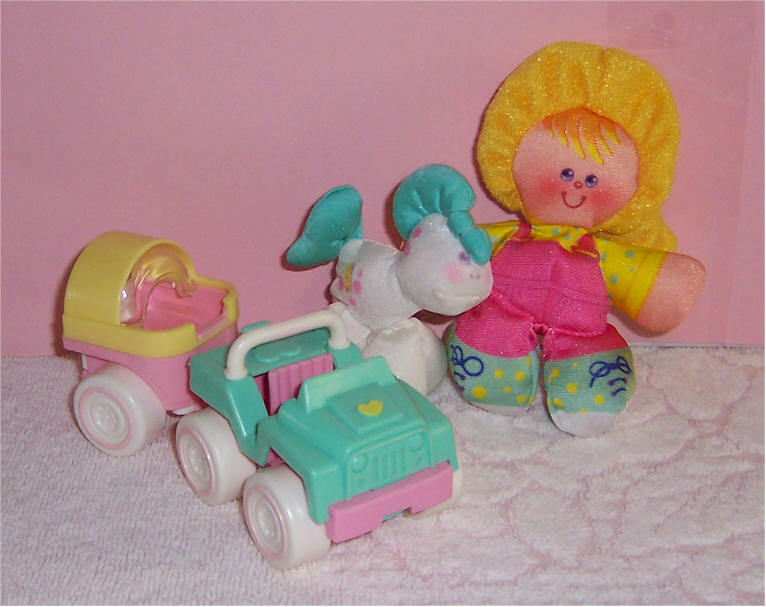 Set includes a horse trailer, Mary, and pony. Camping just got funnier with the Smooshees Cuddler Kathy and her Smooshee pet Companion Kittycamp. Ellie Elephant is a large Smooshee from the Circus Cuddlers line. Comes with Pacerand a caged circus car. Everyone needs a home, even the Smooshees! 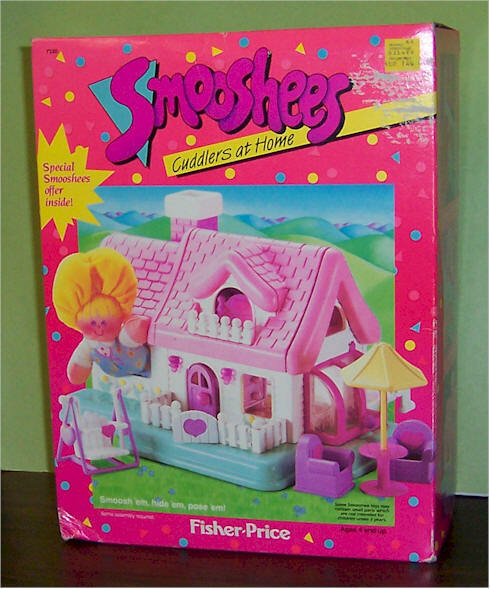 This set includes a house full of furniture for the Smooshees. 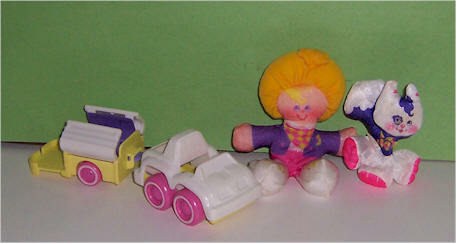 Includes Bonnie w stroller and Beth w her bicycle. 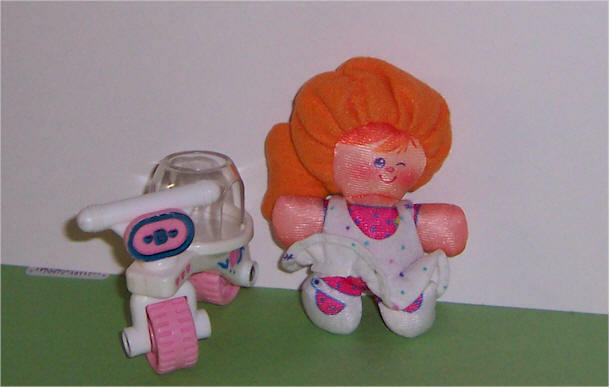 Blast off with the spacey Smooshees Cuddler Judy Jupiter and her Smooshee Companion Neptune the Smooshee Dog. Includes a small spaceship that Judy and Neptune can be smooshed into. The set also includes a tiny anti-gravity jet pack. 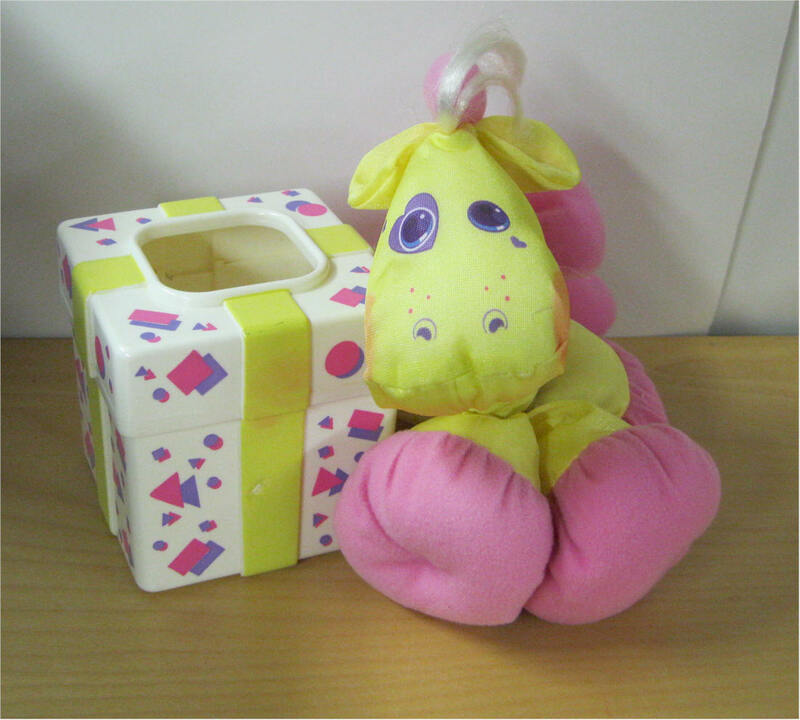 Pacer Pony is a large Smooshee from the Circus Cuddlers line. Comes with a square box. 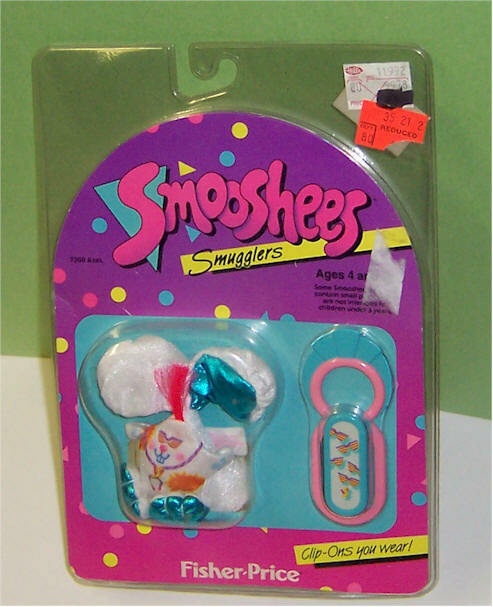 Jubilee Cat is a large Smooshee from the Smuggler Surprise Packages line. 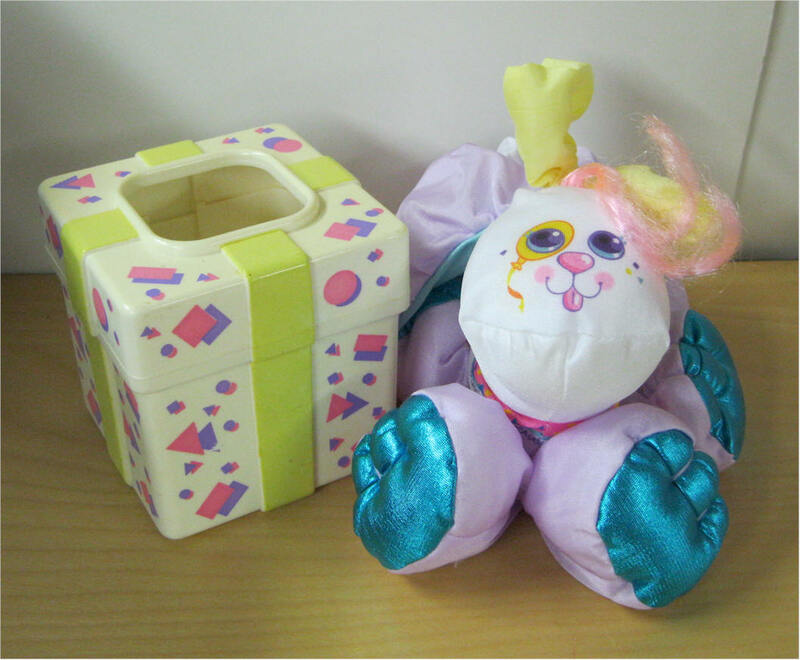 Includes a square gift box that she can be smooshed into. The box has a removable lid with an oval-shaped hole in the top. 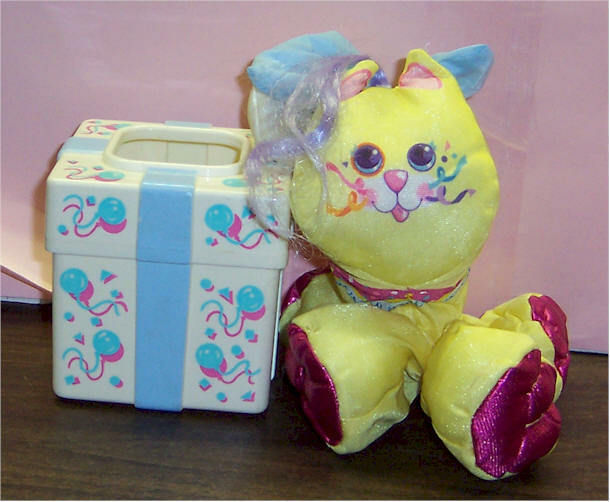 When the cat is in the box, her hair bow can pop through the top to look like a gift wrapped box with a bow on top. 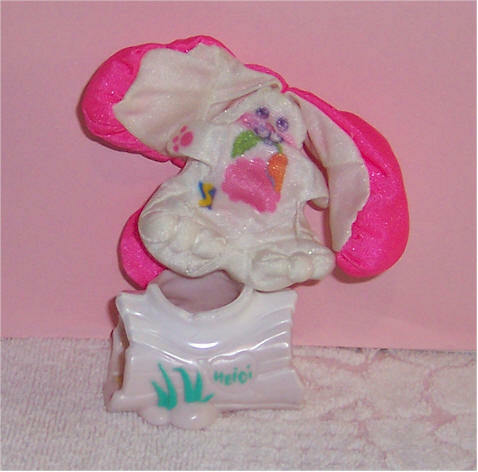 RARE Taffy Bunny is a large Smooshee bunny rabbit from the 1989 Smooshees Easter Assortment. 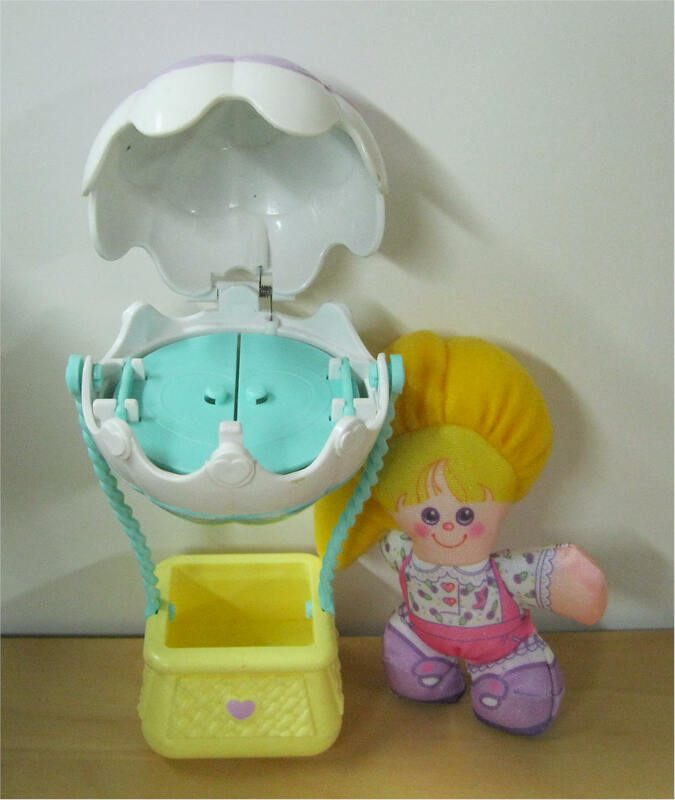 Includes a Easter egg that she can be smooshed into. 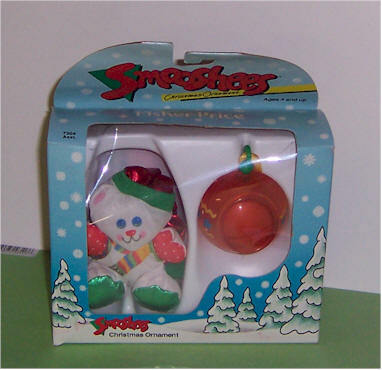 RARE Candy Bunny is a large Smooshee bunny rabbit from the 1989 Smooshees Easter Assortment. 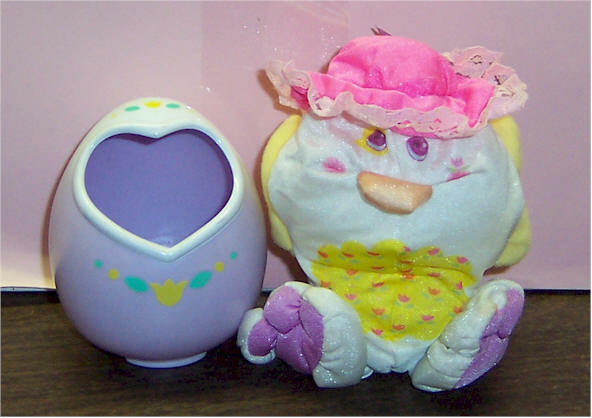 Includes a Easter egg that she can be smooshed into. 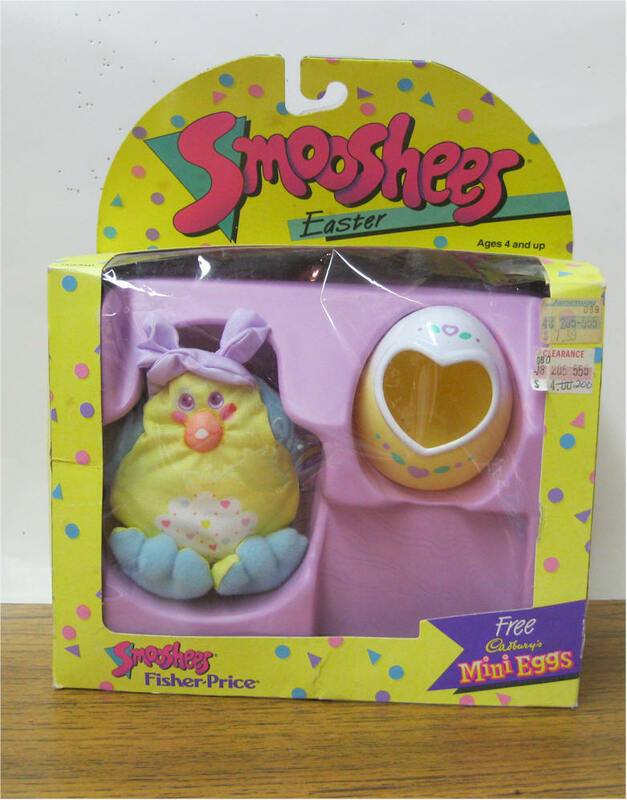 RARE Razzle Chick is a large Smooshee baby chick from the 1989 Smooshees Easter Assortment. 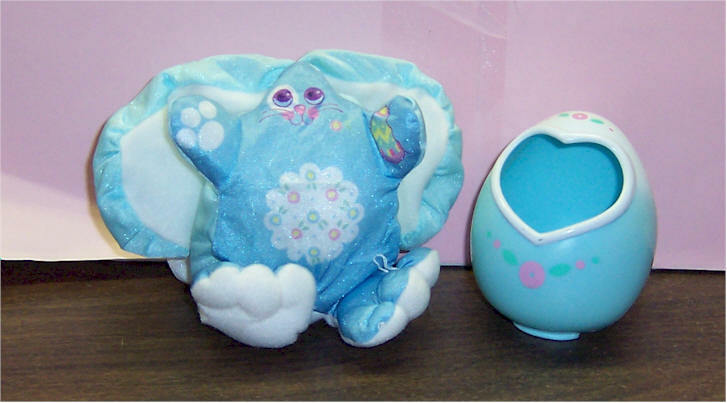 Includes a Easter egg that she can be smooshed into. 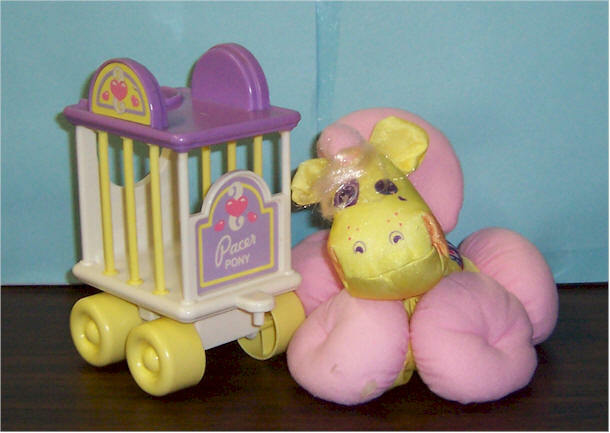 Pacer Pony is a large Smooshee from the Circus Cuddlers line. Comes with a caged circus car. 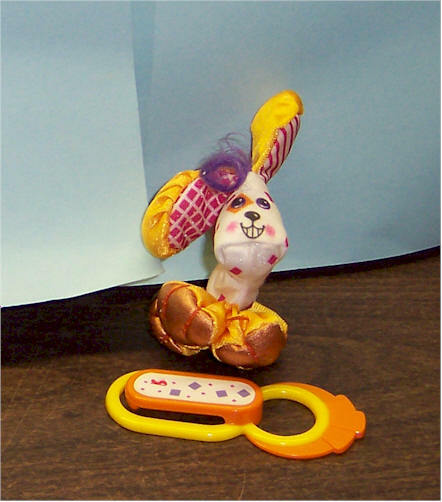 This is a Smuggler Styles set that - includes hair products for little girls and a bunny. 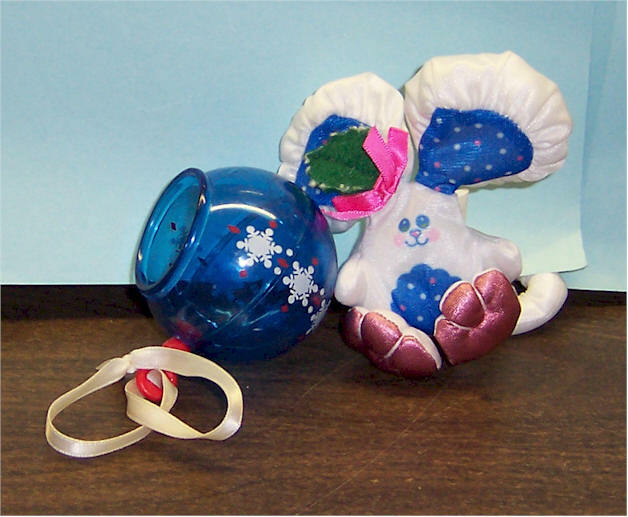 The set includes a hair bow with a charm in the center to smoosh pet bunny inside. Mint in Box. Little boy w skateboard. 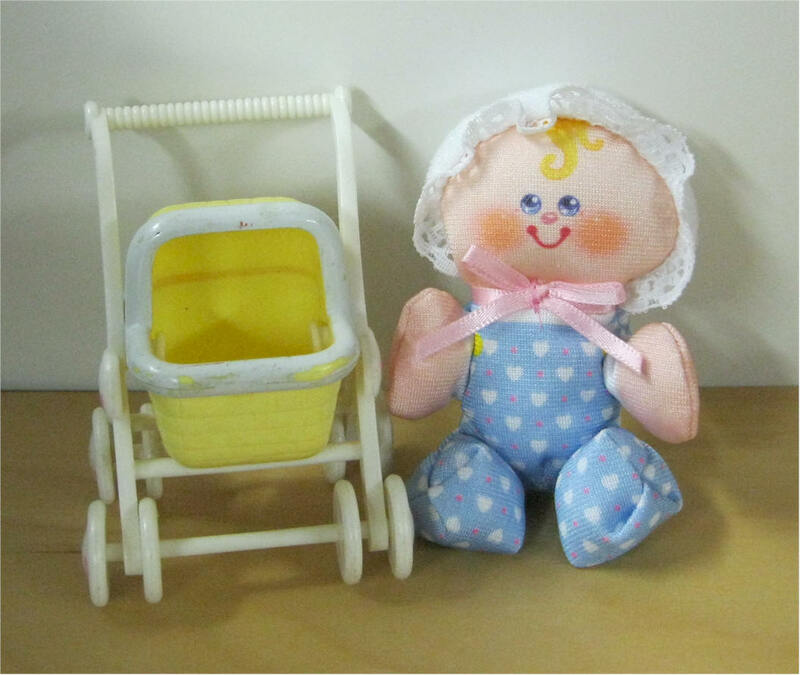 Made of soft stuffed fabric with a pre-printed face, hair and outfit. 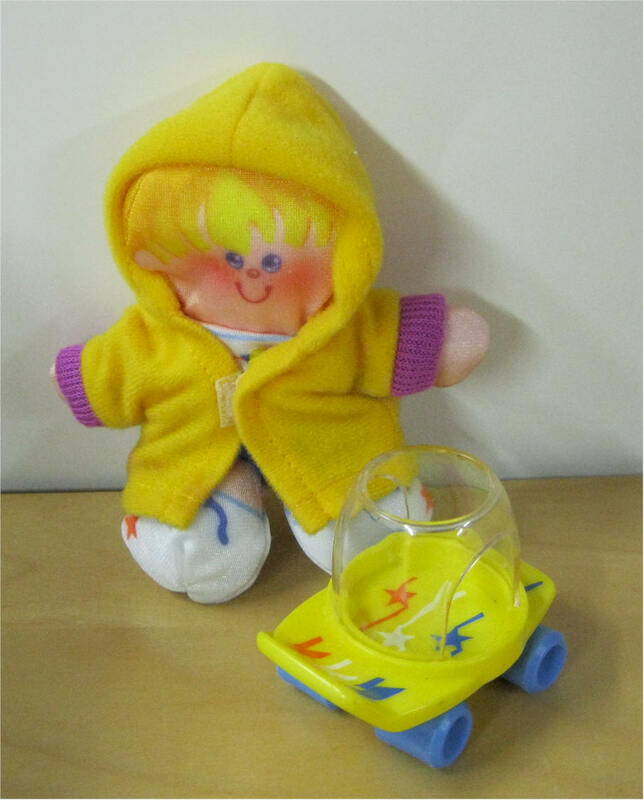 The set includes a removable coat w hood and an skateboard with wheels that the Smooshee can be smooshed into. Dottie Kitten w Plastic Clip. 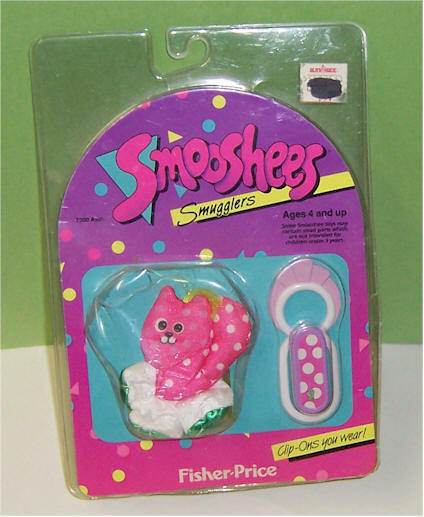 This set includes a plastic clip and a Smooshee cat that can be smooshed into the end of the clip. Puppy Dog w Clip. 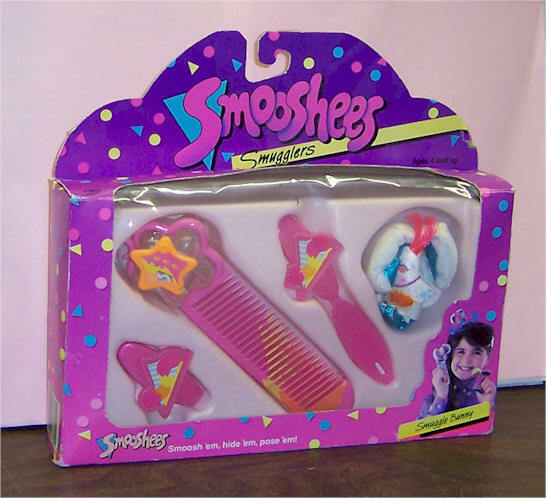 This set includes a plastic clip and a Smooshee mouse that can be smooshed into the end of the clip. Mouse w Clip. 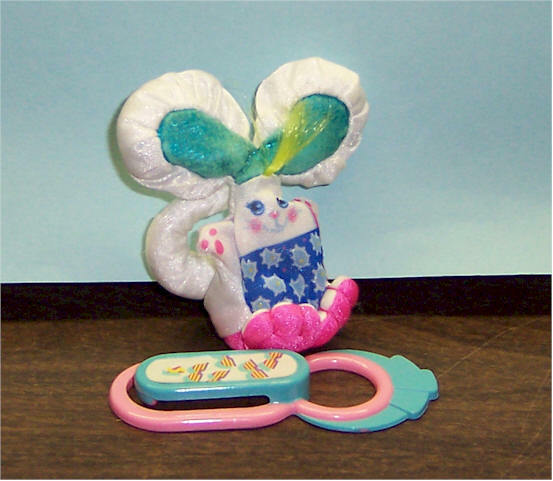 This set includes a plastic clip and a Smooshee mouse that can be smooshed into the end of the clip..
Twinkle Mouse w Clip. 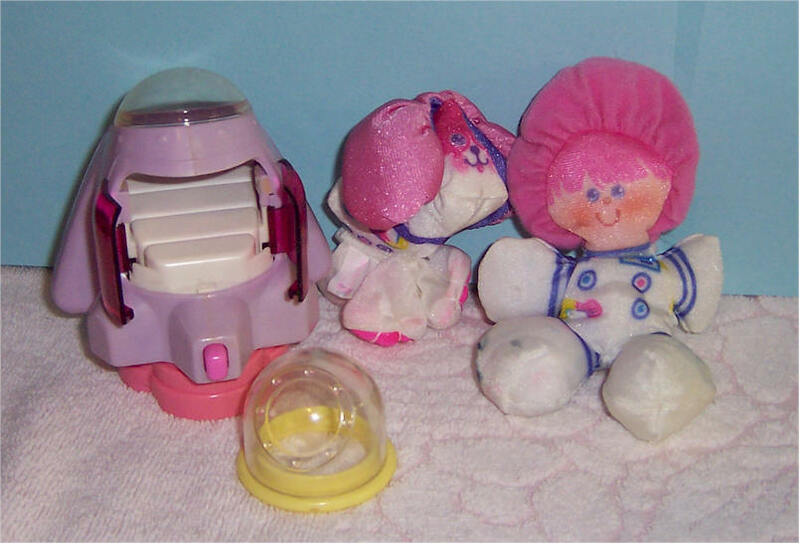 This set includes a plastic clip and a Smooshee mouse that can be smooshed into the end of the clip..
Honey Bear set includes a Smooshee bear, and a tiny plastic honey jar that the bear can be smooshed into. 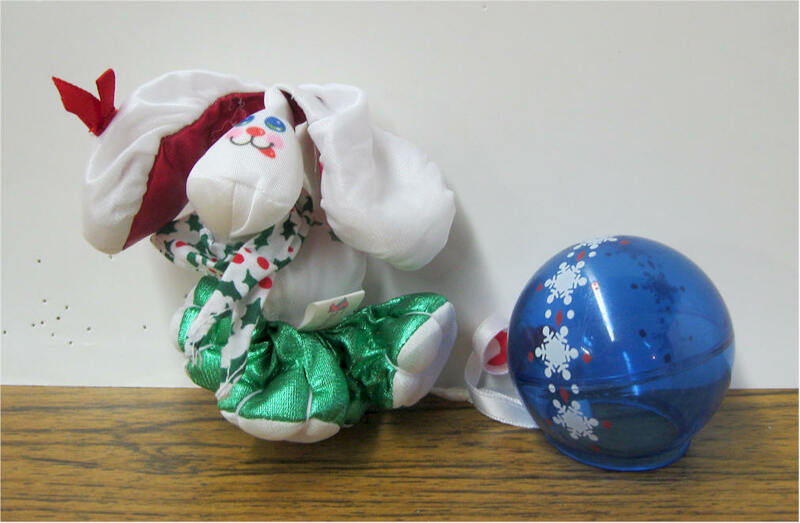 Smooshees Christmas Ornament The set includes a cute little Smooshee mouse decorated for the holiday season and a red-tinted ornament to smoosh the bear into..
Smooshees Christmas Ornament The set includes a cute little Smooshee the Mistletoe the Pup decorated for the holiday season and a green-tinted ornament to smoosh the Pup into. Mint in Box. 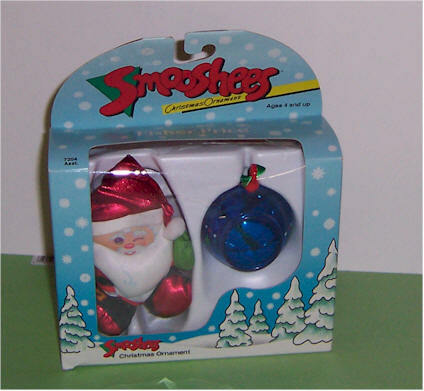 Smooshees Christmas Ornament The set includes a cute little Smooshee mouse decorated for the holiday season and a blue-tinted ornament to smoosh the mouse into.Mint in Box. 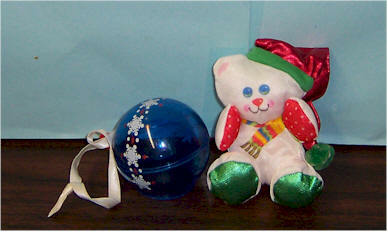 Smooshees Christmas Ornament The set includes a cute little Smooshee Cuddles the Bear decorated for the holiday season and a red-tinted ornament to smoosh the bear into.Mint in Box. 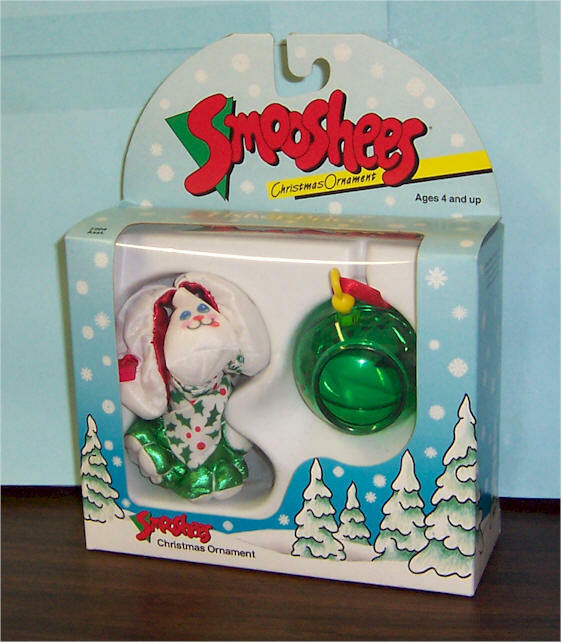 Smooshees Christmas Ornament The set includes a cute little Smooshee Santa Smoosh decorated for the holiday season and a blue-tinted ornament to smoosh the Santa into.Mint in Box. 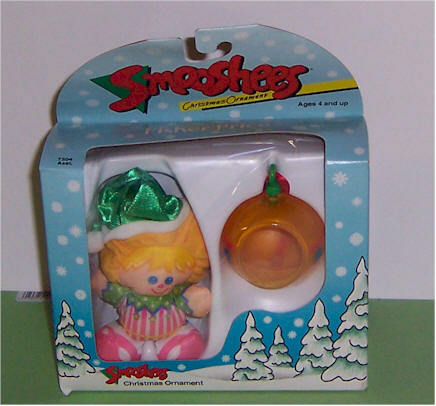 Smooshees Christmas Ornament The set includes a cute little Smooshee Holy the ELF decorated for the holiday season and a red-tinted ornament to smoosh the Elf into.Mint in Box.